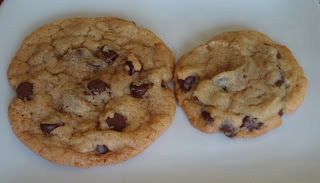 The 2 cookies...one with tons of chips and flatter, the other nice and chewy with good chip to dough ratio. See the difference in the thicknesses of both. Just the beginning of a long baking weekend! 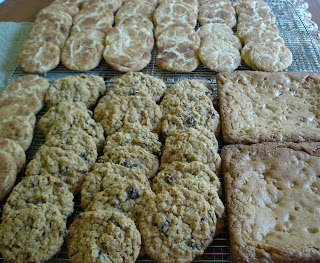 Blondies, oatmeal raisin and snickerdoodles...oh my!! Whew!! What a weekend of baking!! I couldn't even imagine how I would get through ( and survive! ) this long holiday weekend with all the baking I needed to do! My usual bake"athon" on Friday is now doubled due to the second farmers market that just began in Wrightstown Saturday. Now I have to bake for 2 markets on Saturdays and I'm not complaining...really! !...but it is a lot of work for one baker and one oven in one tiny kitchen!! So what do I decide to do? I decided to try out 2 new chocolate chip cookie recipes because I have this crazy idea that somewhere out there is yet another better recipe than the one I am currently using. With that in mind I decided to try one that yielded a flat cookie with, in my opinion, way too many chips in the batter and the second...and my winning choice....a fatter cookie that had a batter that was so quick and easy to prepare. And the cookie was wonderful, chewy and crunchy and although it calls for chocolate chunks, I used chips and they were great! ( And yes, I tried the New York Times Chocolate Chip Cookie but it's a bit too involved) So I baked and baked and baked some more...enough for 3 farmers markets and an auction on Monday!! Yes, I need to rest, myself and my oven. The cake stuck a bit to the bottom of the cake pan but it still tasted great!! The Mocha Butter Frosting had a wonderful coffee flavor. As promised, this is the recipe for the Birthday cake I made for my son yesterday. The absolutely huge volume of recipes is called "The Encyclopedia of Cooking in 24 Volumes" and dated 1949...and let me tell you this is one heavy book!! Each category is it's own little booklet and I'm tempted to take out just the cake and cookie booklets to make it more managable! I really want to try some of the other cake recipes in the book such as, Spiced Devil's Food Cake and Sweet Potato Cake ! Sounds so good!! The one issue I have with almost all the cake recipes I noticed is that they call for shortening rather than butter...was there a butter shortage back then? If anyone knows the reason, I'd love to know. I would like to try this recipe again replacing the shortening with butter but for now, this is the original recipe. Cream shortening with sugar until fluffy. Add molasses and eggs and beat thoroughly. Add dry ingredients and coffee alternately in small amounts, beating well after each addition. Cream butter. Add remaining ingredients and continue creaming until mixture is well blended and fluffy. Will cover tops and sides of 2 ( 8" ) layers. Coffee Spice Birthday Cake ...and Chicken Soup ? Just throw everything into the pot...skins and all!! I gave myself a day off today from my usual Sunday farmers market to take a baking break ...or so I thought and get some much needed rest. My friend , Janet and I got back late Thursday from the Brimfield Antique/Flea market shows going on there all week, We walked all day for hours !! It was exhausting but fun. I only came home with a few things but Janet found lots of pink stuff...her specialty! Even though I took time off from my business baking, I still managed to make a birthday cake and chicken soup! I called my older son, Jim, to wish him a happy birthday today only to find he was sick in bed...so I couldn't not cook or bake for my child. Nothing like chicken soup to make you feel better!! So I made Ina Garten's Chicken Stock Recipe but ...geez...3 whole chickens!! really Ina..that's a bit extreme !! I don't even have a pot big enough for 3 whole chickens!! I made one third the recipe, using one chicken and all the wonderful herbs and veggies she suggests. It did come out great!! It has a great rich flavor and color. As for the cake, I love to collect old cookbooks and I recently recieved, from a friend, an old volume from 1949 of recipes. One of the cake recipes interested me so I thought I'd give it a try. It's for a Coffee Spice Cake with Mocha Butter Frosting. It turned out really very good with nice spice flavor, with molasses in the recipe. The frosting has coffee and cocoa and it had a good coffee flavor. ( I'll post the recipe tomorrow, promise! ).So that's some of what my little boy...I mean..my oldest...got for his 32nd birthday!! Yikes...how'd he get to be 32?! Where'd the time go! Lost on a country road... But a pretty one!! Well Janet (my antique/flea market friend) and I are hitting the road again this week. We're off to Brimfield,Mass. for a few days of treasure hunting !! A few more photos of this past Sunday. I went to the artist tour I previously mentioned (that I baked 300 cookie for ! !..Yikes) going on in various locations . Well the first location was fine but the next place to visit was down this long country gravel road with absolutely no signage to let me know I was going the correct way.The view was well worth it though...but then I will drive just about anywhere for the views! THEN.. I finally get to the bottom of the hill and awaiting me is this stream I am supposed to drive through!!? No, I don't think so. This weekend the tour is going on again and maybe without any rain this week I can traverse the stream...ya' think?! Now that's a pretty amazing view ! It turned out to be a great weekend here and today was especially beautiful. Well again another busy week has flown by! Where does the time go? It's been a busy baking week with 3 of the 4 farmers markets I do already in full swing. The fourth market, which is the second one on a Sat., begins in 2 weeks and I haven't quite figured out how I can be at 2 places at once...anyone have any suggestions, please let me know! I was up to my elbows in flour...well, not really but it felt like it, when there was a knock on my door and this sweet bouquet of flowers arrived for me from my younger son, Kris, still away at college. What a nice surprise! The Sunday market is the most relaxing and less hectic of all. 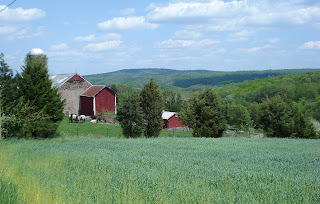 First, because it's on a Sunday, it just feels less hectic and second, the drive is in one of the most beautiful areas ( in my opinion) in Bucks County. After leaving the market today I couldn't resist going down a pretty country road where the view is really spectacular! The farm I came upon had it all! !...green pastures, sheep, a white picket fence...Wow!! Truly amazing!! The artist's studio with walls covered in broken tiles...really amazing!! 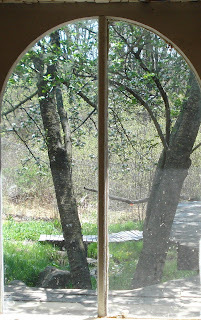 A favorite photo of mine looking out the window of Carolyn's studio. This photo has a painting like quality. I can't believe a week has gone by already since I last posted on this blog! Yikes...where did the time go? The week was filled with so much, between baking for a local coffee shop in Peddlar's Village in Lahaska for the Strawberry Festival this weekend, visiting an artist's studio and preparing for 2 farmers markets. On the subject of the farmers markets, I decided to add some other items to my usual line up of cookie, scones, brownies and blondies. I have added Caramel Corn, Granola, small loaf cakes and my dip mixes. Carolyn, the artist I visited, lives on the most beautiful property with her husband, a landscape architect. Together they have a business, Fringetree, but she also is a printmaker and uses plants to create prints and pottery. There is an Artist Studio Tour there next weekend, which I look forward to attending and I am happy to be baking 300 bite sized cookies also for the tour! 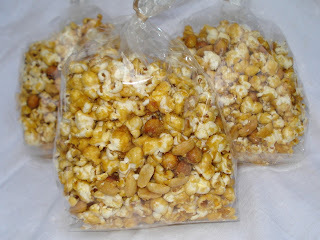 The Caramel Corn is an old recipe I got from a friend about 25 years ago. It uses margarine and it's been such a long time since I've made it that I can't remember if I actually used margarine or butter but I think either way, it's great. Give it a try...I added small pretzel balls and peanuts to the recipe. Bring syrup,brown sugar and margarine to boil and boil 5 minutes. Remove from heat and add baking soda,salt and vanilla. Put popped corn,(peanuts and pretzels if using) in large roasting pan and pour syrup mixture over corn. Stir with wooden spoon to mix well. Bake 1 hour in a 250 oven stirring every 15 minutes. Let cool , then put into containers.